It’s career fair season – time to prepare to put your best foot forward. As part of my mission of setting you up for success, I thought it would be helpful to ask career fair recruiters what they’re really looking for – what are the key things that set some students apart from the rest. 1. They are looking for your ability to talk and be conversational. Students who are confident and can make eye contact, who demonstrate the soft skills necessary to be a professional that can interact well with others, truly are the ones that set themselves apart from the rest of the crowd. This is the number one, most important piece of advice the recruiters shared. Key takeaway: Do all you can to prepare for the career fair using the tips that follow in this article. Get mentally prepared to talk and make conversation. Then relax, be yourself, and make eye contact. 2. They notice the details of what you’re wearing. They understand that you’re a college student, but the details of your appearance count. They notice whether your shirt is ironed, whether your skirt is tight or your top low cut, whether your hair, nails, and make up are professional or if you look like you are heading to a party, and whether you are wearing business-appropriate shoes or a business-appropriate color. Key takeaway: Dress professionally – women, this means no tight skirts, no low cut tops, wear closed-toe shoes with moderate heels, wear a simple hairstyle, and make sure your nails and make up are more subdued and professional-looking. Men and women both need to make sure their clothes are clean, ironed well, of a professional style and color – stay away from red, fuchsia, neon green, and the like. You’re typically safe with greys, blues, black. 3. They notice the details of your resume, especially any mistakes. They carefully read your resume and will notice any spelling, grammar, formatting mistakes. They told me those mistakes can and often do disqualify people. They want employees and interns who care about the little things, who will go the extra mile, and a resume with mistakes doesn’t communicate you are that person. Key takeaway: Triple-check your resume, taking a break between each review, and have others with an eye for detail look it over too. You can’t be too careful here. 4. They’re looking for you to ask them questions. They are looking for individuals who will proactively ask questions, but the best questions are based on the research you’ve done – you want to demonstrate you have researched the company. Key takeaway: Your campus career services office will publish a list of companies who will be attending the career fair. Research each company and go prepared to ask one or two customized questions per company. 5. They want you to be prepared to briefly share what you are looking for. Key takeaway: Practice a one-sentence statement of what you’re interested in, similar to an elevator speech. 6. They’re looking for evidence of work ethic. Candidates who stand out from the rest have past work experience – all those high school and college jobs count. Mowing lawns, waiting tables, bagging groceries, and such all demonstrate work ethic. Key takeaway: All your past work experience belongs on this college resume – it doesn’t have to be super-professional work experience to include. And if you have never held a job before, now is the time to get one. 7. They look at your GPA as an indicator of what type of employee you will be. They use your GPA to gauge your ability to learn, your work ethic, and your ability to manage your time. Key takeaway: Your grades really do count. C’s may get degrees, but they won’t make you super competitive for that awesome position or internship. 8. They’re looking for individuals who take initiative. They listen for clues that you take initiative – little things like whether you’ve sought advice from others working in the field, reached out to people on LinkedIn, researched the company ahead of time. They are very impressed if you’ve come to the career fair as a freshman or sophomore. Even if you’re too young for them to hire this year, they will remember you for next. Key takeaway: If you’re a freshman or sophomore, go to the career fair. Look for ways to take initiative. Don’t just talk about it, do it. Share about what you’ve done, in a genuine, non-salesy way of course. 9. They’re looking for individuals who will be involved and contribute. Key takeaway: Get involved in your community and on campus, and list that involvement on your resume. 10. They’re looking for maturity. They told me it absolutely does not impress them when you come with a friend. Dress and act professionally. Speak up, make eye contact, and be confident. Key takeaway: Make sure you go independently, so you can stand out on your own. If you end up talking with the recruiter with other students present, make sure to speak up and hold your own in the conversation, without dominating. 11. Every interaction with the company is part of the interview. Be aware they’re assessing your viability as an excellent employee/intern at every step of the interviewing process – the career fair, informal interactions like meet and greets, emails, phone calls, conversations in the waiting room, and so much more. Key takeaway: Don’t waste any opportunity to make the best impression possible. 12. They want you to like them too. Recruiters are human – they want to be liked and do the best job for their company by recruiting excellent employees/interns. They’re putting it all out there, and can be absolutely exhausted at the end of the career fair. Key takeaway: Communicate genuine interest in them and express authentic appreciation for their participation in your school’s career fair. Get their business cards whenever possible and follow up with a sincere thank you. I hope this insider’s take on the career fair will really help you really stand out from the crowd this year. 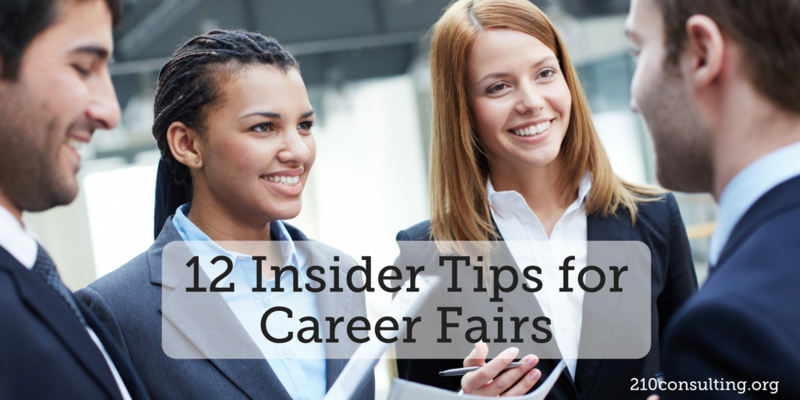 Would love to hear any other tips you have for rocking a career fair in the comments below.